On a professionally guided offseason trek through Yellowstone, the author discovered how new concerns about overcrowding and environmental damage in the national parks are being eased by tour operators. To me, and likely most Americans, national parks have long been synonymous with the idea of packing up the station wagon for a summer family road trip. Unfortunately, treks to the parks were not in the cards when I was a kid. And in recent years, places like Yellowstone and the Grand Canyon have fallen off my bucket list after I read one too many stories about the summer crowds and the sheer difficulty of finding a room anything less than a year in advance. So when Tauck invited me on a recent winter tour of Yellowstone as part of its ongoing “Ken Burns American Journeys” tour series, I jumped at the opportunity to see it during the offseason, considered the prime time for viewing the wildlife and the park’s plethora of geysers and thermal pools. As winter bore down, however, I have to admit I questioned the wisdom of that choice more than once — including on the morning we stood outside the Old Faithful Snow Lodge in minus 13-degree temperatures preparing to board our snow coaches (specialized vehicles designed to operate over snow and ice) for a daylong trek through the park where the only stops would be at unheated outhouses and a warming hut or two. Indeed, cold derriere and all, the trip ended up becoming not only one of the most memorable of my life but also one that I realized could only be provided by a professional tour operator. It highlighted the options that only a tour operator can offer for seeing Yellowstone in its wildest, most natural form as well as the positive role that operators can play in combating overtourism in our national parks and across popular tourism destinations around the world. When Tauck invited me to experience one of its special Ken Burns American Journeys in Yellowstone, I jumped at the chance. Not just because I&apos;d never been to the park, but because of the potential for wildlife sightings. According to the National Park Service, more than 300 million people visited national parks last year, the third highest attendance since record keeping began in 1904. On the other hand, some fear that we could also be loving our parks to death. The recent government shutdown underscored two points: how much some people take the parks for granted and how little they understand the very delicate balance between nature and wilderness. While most park employees were furloughed for 35 days in December and January, the parks remained open, leading to problems with overflowing trash and toilets and reports of vandalism. Conservationists feared that the fallout could result in the reversal of years of conservation efforts, including attempts to wean bears and coyotes from associating humans with food. There were also concerns about the damage caused by visitors wandering protected areas unchecked and, of course, about problems like pollution from human feces. But even when the parks are fully staffed, the sheer number of visitors leads to problems, from the family that thought it was rescuing a baby bison and put it in their car — after which it had to be euthanized — to countless stories of visitors getting way too close to and harassing wildlife to take photos. Many visitors drive through on their own, jostling with crowds for views and never learning the history or about the unique cast of players who spent years and untold millions to create this unmatched legacy. Nor do many comprehend just how much damage even the most well-behaved visits can wreak on the ecosystem. For example, on our tour through Yellowstone we had an unusual and exciting bison encounter that appeared to most of us to have ended without harm. 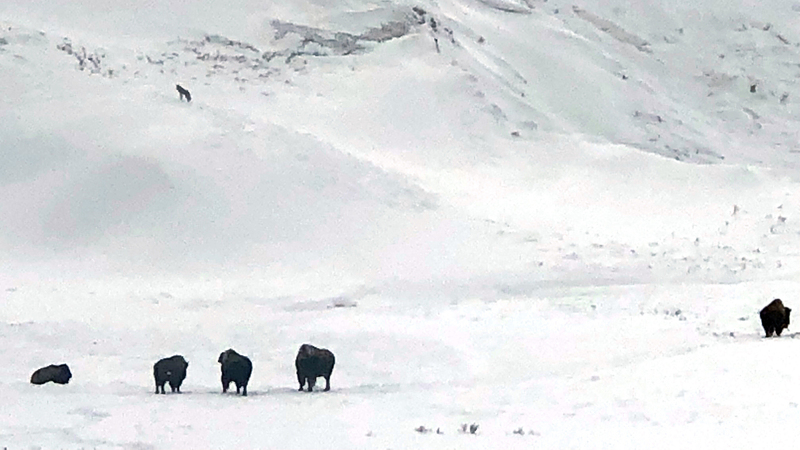 It happened as our snow coach — probably the first on the road in the largely deserted park that morning — came across a lone bison blocking our path. We had already encountered several bison during our trip and were expecting that this one, like the others, would slowly move out of our way. However, as we inched forward to maneuver around the bull, which tour director Zack Pennington estimated to weigh 2,000 pounds, it became clear that the animal wanted no part of us on his road. When we veered left, so did he. As we moved right, he did the same. Then his tail started moving, a sign he was becoming agitated. And he began running back and forth in front of and slightly beside us, appearing to be on the verge of ramming our snow coach. We finally made our way past, hoping he would settle down before the rest of our group, in a snow coach behind us, came through. What we didn’t know was that a group of snowmobilers had moved in between our two coaches. Fellow travelers captured on video what came next: several very close and scary encounters as the bison charged the snowmobilers who had stopped, then two-by-two sped through openings to rush past the huge bull. One sideswiped a snow bank and nearly tipped over. Later, as we all laughed and marveled at what we had seen, it was clear that Pennington and a park employee were concerned. It is unusual for bison to get that wound up by vehicles on the road, Pennington explained, and it was always troubling to see a bison expend unnecessary energy during the winter because the species needs all it can get just to survive until spring. Fortunately, until a few weeks prior, it had been a fairly mild winter in the park. So hopefully, Pennington said, the big guy was just frisky and used to doing whatever he wanted, including not sharing the road. When I first arrived in Montana for one of Tauck&apos;s special Ken Burns&apos; Yellowstone winter wonderland tours, we watched a video clip with the famous documentarian talking about the exhilaration of experiencing a "three-dog day" where you spot a wolf, coyote and a red fox. While to many, motorcoaches barreling through national parks and crowded cities like Rome and Venice have become a prime symbol of overtourism, they are also increasingly seen as part of the solution, helping parks manage crowd flow, protecting the environment by reducing the number of cars and offering tourists options for traveling the congested roadways stress-free. While Tauck and numerous other tour operators have been running trips though national parks for decades, Palmer said their role and perception has evolved. But as crowds have increased, he said, tour operators and the parks system have begun working more closely, and “discussions have become more specific about how to help with overcrowding,” whether by tweaking tour dates or by altering itineraries. "They want everybody to visit, but they want that visit to be meaningful, to have context put to it." Noel Hentschel, chairwoman and CEO of American Tours International, a leading tour operator for inbound travelers, said the parks are a must-see for foreign visitors, and tours by licensed operators guarantee a safe, informative experience. Palmer said the park service also recognizes the important educational aspect tour operators provide. Indeed, the days of the iconic summer road trips to national parks are long gone. Today, to get a hotel or camping spot in or near a national park can require planning a year in advance, unless you are part of the small minority of visitors adventurous enough to wander off the main roads and into the backcountry. And while guided tours can be much pricier than traditional road trips, they can also provide access to areas that would otherwise be unsafe to open to the general public. 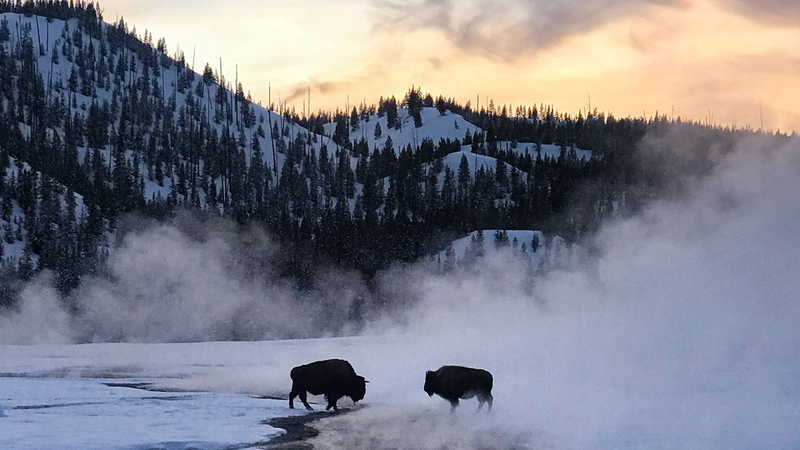 Among the options Tauck and other tour operators have created in recent years are itineraries like the one I took to Yellowstone in the winter, when most of park is closed except to licensed operators guiding day tours and multiday trips in snow coaches and on snowmobiles. During our mid-February tour, we occasionally ran into one or two other snow coaches and snowmobile groups. But for the most part, it felt like we had the park to ourselves as we tooled along hoping for a “three-dog day” — a trek on which a wolf, a coyote and a red fox are spotted. Although we had a few false (or rather, hopeful) alarms, the closest we came to seeing a wolf were tracks along the road spotted from a snow coach by hypervigilant tour director Pennington. It’s almost impossible to describe the pure magic of having the park in all its natural wonder almost exclusively to ourselves, of being able to pull over on a whim to watch a bald eagle, of seeing a herd of bison going on alert as two coyotes come over a snowy hillside or of viewing the steam, exaggerated by the cold, as it comes off Old Faithful and the countless other mud pots, geysers and thermal pools that make Yellowstone unique. Summer or winter, crowded or not, Burns and Palmer both emphasized, every American should make it a priority to visit the national parks because, in the end, the biggest threat to them is not overtourism but apathy. Today, their partnership is going strong, with Tauck offering special “Ken Burns American Journeys” trips that include lectures and viewings of vignettes produced by Burns exclusively for Tauck. I was hosted by Tauck on one of the Ken Burns itineraries through Yellowstone National Park in the winter. I’m still not sure if it was the topic or the delivery, but the passion displayed by Burns and his series co-producer, Dayton Duncan, a former director of the National Parks Foundation, was downright contagious, making an already enjoyable trip through the wild and largely deserted winter wonderland a truly life-changing event. As Burns told me, the documentary series was never intended to be a travelogue but rather the story of how our unique national parks system came into being. During the vignettes, we learned of the yearslong movement to turn places like Yellowstone, the Grand Canyon and Yosemite into public lands accessible to all. For Americans like me who have long taken these treasures for granted, having access to his insights while experiencing Yellowstone was eye-opening. “Somebody wrote to me, I think it was a 19-year-old, about Denali National Park,” Burns recalled. “He said that being in the national parks reminds you of your atomic insignificance. That’s what national parks do.” — J.C.